(Photo by Chris Farina – Top Rank) by David Douglas: The sport of boxing, and the business of boxing, is reserved for men and women who have character, in and out of the ring. Respect and honor is earned, literally, by the blood, sweat, and tears of the boxers in the ring, the expert boxing trainers that help prepare them, by the cut man with their precision in the corner, the diligent managers and even the eager promoters that make or brake careers…and yes, at times, sometimes more than not, this family of pugilistic passion, rears its ugly head of dysfunction. But, because everyone knows the price payed and time invested by those subjected to a not so pleasant passionate exchange, at the end of the day, the deserved due respect is given. So, in case you haven’t been properly informed, you are not of this family of pugilism…you are not even worthy of being in a boxing gym, or most importantly, in a ring corner. How you managed to hustle your way into a significant boxing gym is on you. That said, you were a wannabe from the start, and that is all you will ever be in the world of boxing. To further devalue yourself, you cowardly assaulted a man who mirrors what you only wish you could be. And to sadly and pathetically degrade yourself even more, you mocked this man’s, and all others who are challenged by Parkinson’s disease, chronic illness. 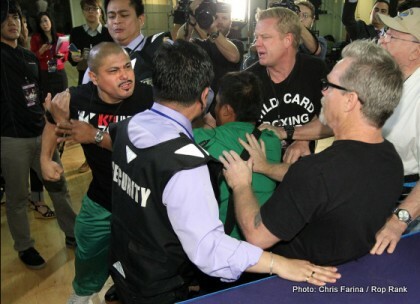 You owe Freddie Roach an apology! And that weak challenge you proposed to him while on camera, I can assure you that you are not even capable of carrying his spit bucket.